There are a lot of things that we had close to our heart in the childhood which has taken a different shape these days and does not matter to us at all . One of the greatest inventions of mankind – the Eraser or popularly (dearly) known as Rubber in India. It took a lot of years to understand that Rubber was different from an Eraser. Nevertheless it was one of the prized possessions of ours during our school days. 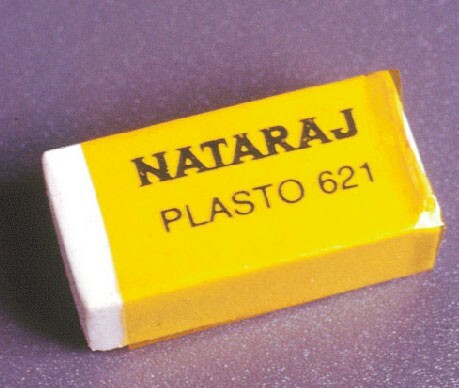 Talking about erasers, the flagship brand was Nataraj back then ( even now i guess ). One of the Unique selling proposition of Nataraj eraser was the golden yellow foil that was surrounding the thing. I still remember getting furious when someone takes that off my eraser and I remember a few people who collected them as well. How many ever times i see this eraser , I still do not get the meaning of 621 plasto. But it looks good on the eraser ( Atleast that has not changed since then ). Erasers were put to good use back then as we normally write more with mistakes than without. Apart from the standard usage as prescribed by our parents and teachers, we have invented newer ways to engage our pastime with erasers. Half the kids in School apply oil on their heads only for this. Every class will have a donor who will provide us with the necessary quantities of oil to make imprints. Clever kids always use others’ textbooks to take imprints. It was more of a status symbol those days as who takes flawless imprints from text books and I must say i was an expert. The only hard part was to rub the imprint off to take a new one. Needs a lot of hardwork. There was this myth back in school when the dust generated after rubbing a lot can also be recycled to use. The theory goes on like this – you rub a lot and collect the dust ( that shredded particles of the eraser ) and put that in boiling water and you get a brand new eraser. I wasn’t foolish enough to try that but we must appreciate the scientific thinking and the recycling vision back then. Sometimes these erasers can be used to identify the students. This habit was brought into prominence by parents who were sick of buying new erasers day after day as kids lose it very easily. So they write their names boldly with initials so that it is easy to find out when the erasers are lost. However we can get to know the child’s name when we turn the eraser back and ID cards were not necessary. My mom used to write my initials on three sides i remember that. Every student learns the art of team work by helping his friends during examinations and our hero plays a major role in this as well. As we grew up , we used erasers for just that. This is when the Non dust erasers had the laugh as they were larger in size as it was easy to mark 30 answers in that. But greater the size, greater the risk. I am not sure whether the children of these days use erasers like the way we did. We did share a special bonding with them. It is definitely worth writing about it as well. The memory of using a Nataraj Eraser cannot be erased by any eraser. Thanks Nikhil 🙂 Happy that you remembered the good old memories. Awesome! You made me remember my Childhood.. Way to Go !